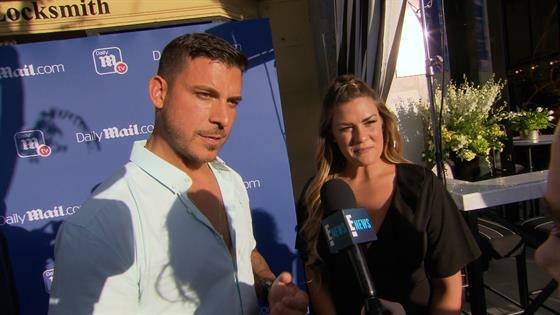 Jax Taylor and Brittany Cartwright's wedding will be done their way. Vanderpump Rules co-stars Katie Maloney and Tom Schwartz called upon Lisa Vanderpump to officiate their 2016 nuptials, but don't expect the reality TV show's matriarch to resume her duties for Jax and Brittany. The recently engaged couple told E! News at the DailyMail.com & DailyMailTV Summer Party on Wednesday that they've already bestowed that important responsibility onto someone close in Brittany's life. "I love Lisa to death," Jax shared, "but I don't think I'm going to have her officiate my wedding. I think we already have someone in mind. We have her pastor back home." "Lisa will be there!" Brittany did assure, adding, "She'll have the best table in the house. We'll make sure she's taken care of." So is there anyone from the Vanderpump Rules cast that won't receive an invite to the soiree, which Brittany revealed is taking place at a castle in Kentucky? Apparently so, but Jax couldn't reveal who they're snubbing. In June, Jax proposed to his girlfriend of three years with a stunning, $70,000 engagement ring. For even more details about the lovebirds' big day, press play on our video above!